standing around waiting to inhale, Derek T. Franklin — Anytime Dept. As I stand in the shade with my feet in the murky leaking waters and absorb the energy of a hot summer day as the cooling fingers of the polluted tributaries to nowhere radiate through my body. I am reminded that there is a beauty to the way yarn will turn a piece of cured pig fat intothe shape of a bow. That bow becomes irresistible between the stones that jetty the view of my dominance in the world. My violent hands are slow, patient and calculating because the world has never told me that they should act otherwise. The intimate ghosts of my imbued violence are negated by the medicinal powers given to my ancestry as we imbibe and celebrate our labor and our food that heals skeletons of trauma from this violent place we call home where all is justified in we feel anointed and desire is procured. It is all quite cinematic, the way the stem caresses the sunlight coming through the trees and laughter from old stories witness the present. I wait in the undercommons of my own mind to stand around waiting to inhale because the songs we used to sing will give us the impressions of disappearing without a trace. Anytime Department is thrilled to present standing around waiting to inhale, a solo show from Derek Tyler Franklin and the project’s inaugural exhibition. Derek Tyler Franklin is a multidisciplinary artist whose work emphasizes a dialogue between sculpture and printmaking to create works that are both conscious of the space they inhabit as well as the story-telling potential suggested by the rural, the everyday, the formality of producing and providing. 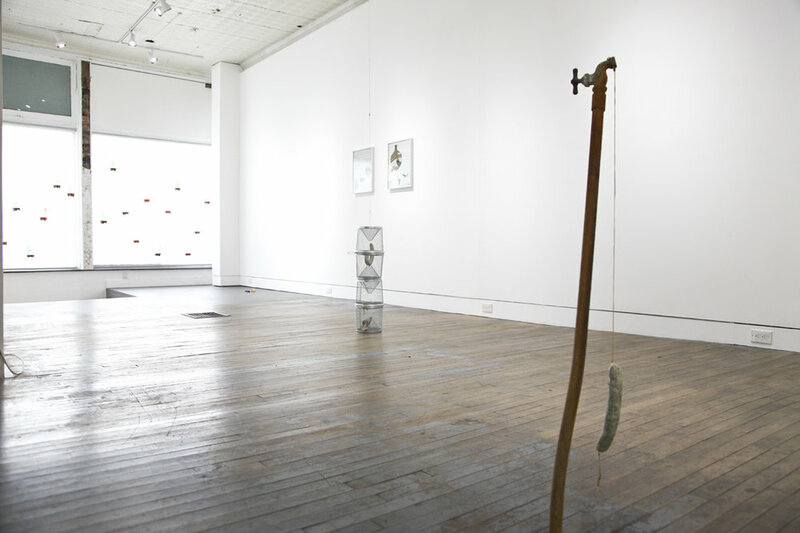 Through the use of crawfish traps, animal casings, and drainage ephemera Franklin chronicles the power, destruction, and beauty latent in observation and creation, violence and healing that are lyrical elements of the everyday. Derek Franklin, b. 1981 in St. Helens, OR lives and works in Portland Oregon. 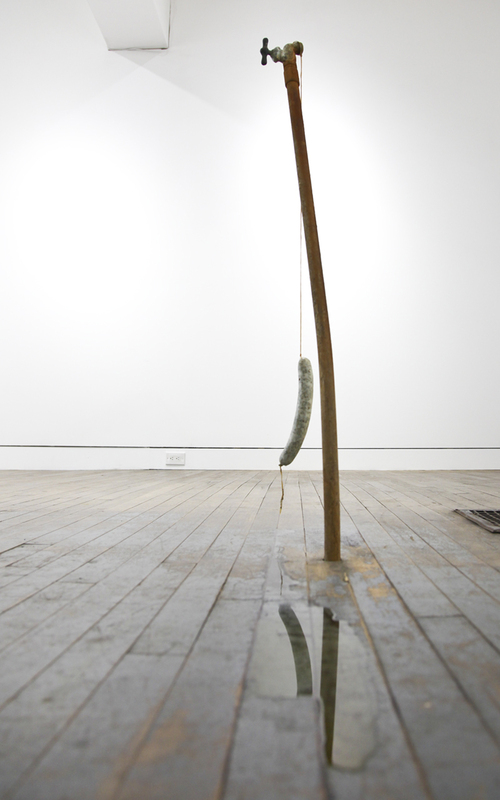 He has exhibited at Thierry Goldberg, Simone Subal, Soloway, Y gallery and Rawson Projects, in New York. 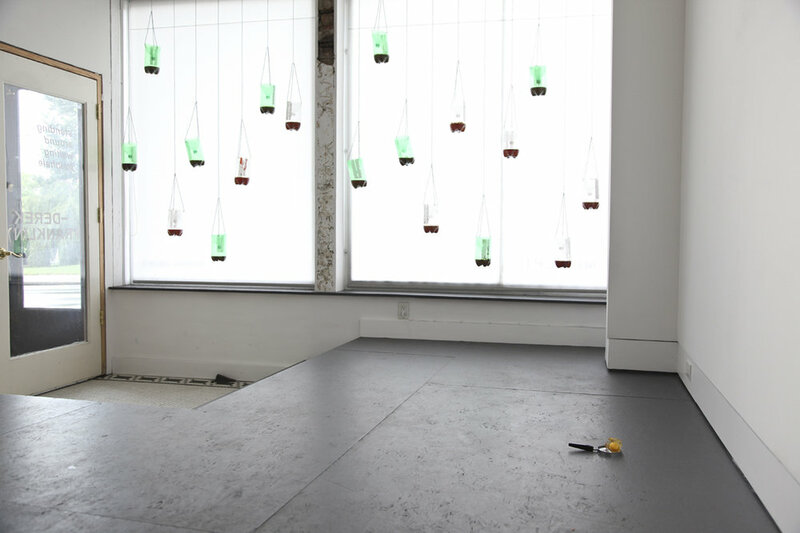 Franklin has also exhibited with Andel 31, Ditch Projects, Rocks Box Fine Art, PDX Contemporary, The Performa Biennial and Pulliam Gallery. Derek is currently represented by Document and Thierry Goldberg Gallery. He has a forthcoming solo exhibition projects this summer at Williamson-Knight Gallery in Portland, OR. Derek Franklin is also an educator, curator and organizer. He was a long time partner and director at Soloway gallery in Brooklyn, NY. He has worked on exhibitions at the Portland Art Museum, Portland Institute for Contemporary Art and The Kitchen. His curatorial projects have been written about in the New York Times, Modern Painters, Art Forum, Flash Art, The Observer among others. Derek is currently the Art Program Director at Marylhurst University and Assistant Professor of Art. Before teaching at Marylhurst, Derek was faculty or visiting faculty at Portland State University, Rutgers University, Union County College, Virginia Commonwealth University, and Pacific Northwest College of Art. Anytime Dept. would like to thank Matt Distell and The Carnegie for their collaboration in this program.